Video clip synopsis – Stone ruins on Western Australia’s remote West Wallabi Island are the oldest structures built by Europeans in Australia and tell a tale of mutiny and murder. Broadband MP4 batavia_bb.mp4 (17.7MB), suitable for iPods and computer downloads. Batavia Shipwreck Ruins is an episode from the series Australia’s Heritage – National Treasures with Chris Taylor, produced in 2009. Take a voyage of discovery with Chris Taylor as he reveals the secrets behind a fascinating mix of treasures from Australia’s National Heritage List. The Batavia was a flagship of the Dutch East India Company — Verenigde Oost-Indische Compagnie (VOC). This was a private company of merchants — one of the first in European history. The key business of the VOC was the spice trade centred on the fertile tropical islands comprising what is today Sri Lanka, Indonesia and Malaysia. The VOC was centred on the Dutch depot-city of Batavia (now modern day Jakarta), on the key Indonesian island of Java. In the first half of the 17th Century, the VOC was the wealthiest and most powerful merchant company on earth and the most important organisation and largest employer in the prosperous and powerful United Provinces of the Netherlands. Encouraged by the successful return of General Carpentier earlier in 1628 with five richly laden vessels, the Directors of the VOC had ordered that eleven vessels be equipped for further voyages that year. 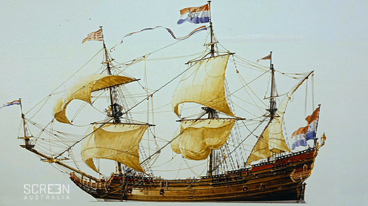 The Batavia sailed from Amsterdam for the East Indies on her maiden voyage on 27 October 1628. The President of the fleet and senior VOC commander was Francisco Pelsaert, who travelled on the Batavia. Pelsaert was accompanied on the vessel by the skipper Ariaen Jacobsz and the officer in charge of the cargo, Jeronimus Cornelisz. The vessel had 322 people on board as well as a large quantity of trade goods. To facilitate the purchase of goods in the Indies, it also carried 12 chests of silver coin, jewels and other treasures. During the voyage, Cornelisz conspired with Jacobsz, the pilot, and other officers to mutiny and seize the ship and its riches. Before the mutiny took place, however, the ship ran aground on Morning Reef in the Wallabi Group of the Houtman Abrolhos Islands during the night of 4 June 1629, leading to the violent and gruesome events that soon transpired. What is the location of the oldest known structure built by Europeans on Australian territory? Describe the structure, and explain why it was built. When was the Batavia wreck discovered, and where are sections of it currently on public display? Explain Australia’s Underwater Heritage Legislation, and the initial reason for its introduction. Carry out research then draw a map of the world showing the maritime sailing routes of the 17th century Dutch East India Company. Ensure you identify and label locations and geographical and national regions on the map, including the location of where the Batavia was shipwrecked. Note that if you click on the link to “Main article: Batavia (ship)” in the above Wiki site, you will find extended information about the Batavia shipwreck.